Back in 2006 and 2007 the introduction of Apogee’s Duet and Ensemble FireWire audio interfaces transformed music recording by making professional sound quality accessible to the home studio. Duet and Ensemble also simplified the experience of using an audio interface with streamlined controls and tight integration with Apple’s Core Audio driver and Logic Pro and GarageBand music creation software. These two revolutionary Apogee products have been often imitated but never duplicated. 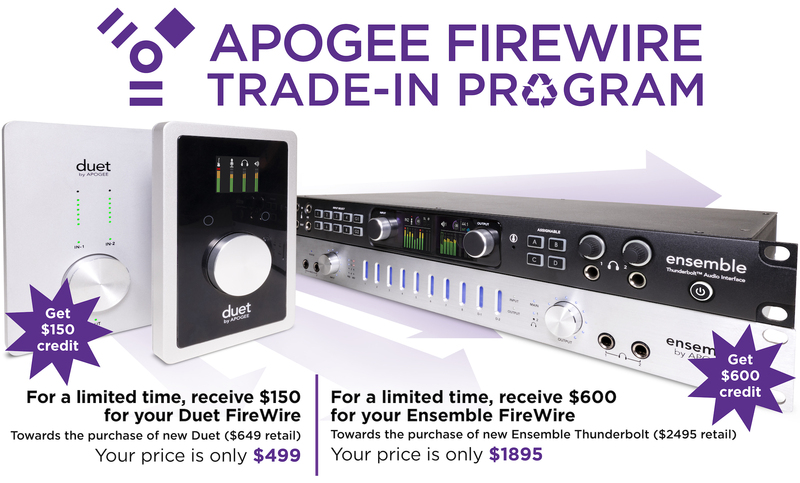 We know how much you love your Duet and Ensemble FireWire. But as awesome as they are, the world of computer audio recording has moved on. So, we want to help you move forward. That’s why for a limited time we are offering customers who trade in their FireWire Duet or Ensemble an unprecedented discount on Duet for iPad & Mac or Ensemble Thunderbolt. You can only apply this credit to the purchase of a Duet for iPad and Mac, Element 46 or Element 88.